I was really relieved to find a ride back to Jerusalem from my daughter’s high school, saving me an hour and a half shlep to and on the bus home. And then the mother driving started talking about a topic which is of great importance to her: Socks. At that school, she said, the girls have to wear socks but the mothers don’t wear socks. And that is why that school is going downhill. And at that other school, she said, the girls have to wear socks and the mothers wear socks. And the principal even kicked out a youth-group counselor who was seen after school not wearing socks. And that’s consistency: true education. And I cannot tell you how little I could relate to what she was saying. But I used to be different. I used to spend a lot of time, like this mother, thinking about socks. Was that other mother wearing them? Or was she not? And what did that say about her? And, more importantly, should I wear socks? Should I not wear them? Should my daughters wear them? Or should they not? And what did that say about me and us? In fact, this was such an important issue to me that for several years I would spend an hour a day walking my daughters back and forth to a different neighborhood, since the alternative gan 5 minutes from my house would require my daughter AND me to wear socks. And I didn’t want to. It was just too much. It just wasn’t me. And then something switched in my attitude. And after that switch took place, for several years, I sent my kids to gans and cheiders that required me to wear socks. And I did so happily. With none of my sock hang-ups of former years. And nowadays sometimes I wear socks and sometimes I don’t. And whether other women are wearing socks? I know so many deeply religious women whom I respect profoundly on both sides of sock divide. I just stopped caring. So when did that fateful switch take place? It happened the day I was looking through some of our family photo albums. And I saw photos of myself during sock-wearing periods. And photos of myself during sock-free periods. And it was funny to think how much angst and identity-searching had accompanied my choice of footwear, cause, in all the photos, from the calves up I looked exactly the same. Socks or no socks, for better or for worse, I was always me. My daughters’ high school made a switch some years ago from allowing the girls to wear socks, as long as there was no gap between the socks and their skirts, to requiring them to wear tights. My girls spent quite a lot of time sharing their opinions about this! Eventually my husband pointed out that really there were more important things to worry about. Similarly, many years ago, I taught in a chassidic girls’ school where in the year that they turned 15, the girls received a letter telling them that now they had to wear a certain type/thickness of tights. Again – the first week back after the letter, they spent a lot of time discussing it. It seems that whatever the options, socks/tights are a very contentious issue, and you’re absolutely right – from the calves upwards it makes no difference. So, although people do seem to use it as a sign of frumkeit, or where you place yourself on the political/religious spectrum, it probably isn’t worth the angst! Being a Christian, I am amazed regarding this subject. I wear socks all the time. They keep my feet warm. I even wear them to bed. i think that this sock issue is a good example of how we get lost in the details of our lives, and lose sight of the goal. as religious Jews, we follow halacha according to an interpretation guided by our Rabbanim. If we identify ourselves within a particular stream of Judaism, then we have a ruling regarding how to implement the halacha. what one group decides is not better or worse than others. just different. But if you’re not sure quite where you fit, then that confusion can manifest itself in the concerns about what to wear on one’s legs. Do you think there is a correlation between the neshama and this test? Why is it so hard for so many of us. Carol, is the test whether or not to wear socks or whether or not to judge people on whether they wear socks? OMG its really true, the whole socks thing is real dilemma! 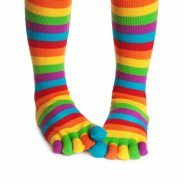 I currently send my oldest daughter to a school that requires both the girls and their mothers to always cover their legs with tights or socks and i find it so difficult in the summer! Thanks for bringing this up, as apparently it is a conflict for many of us. I grew up very modern with very few, if any laws of tznius. Now as a jewish mother who has become much more observant, I find it very tricky in how to guide my daughter regarding this issue. As a previous post stated, unless you are part of a community that is all aligned on this topic, there are so many shades of gray. Just a passing thought on this topic… We are starting to look into schools for our first daughter which certainly in Israel (I don’t know the scene in chutz la’aretz) is basically when you have decide – at least superficially – which box you are putting your family into. One piece of advice that many people have given us is to choose a school where the families that send there are similar to your family. That way you don’t have to deal with (or at least, in theory, you minimize) the types of conflicts of “in school they do X but I do Y” such as the sock issue. The girls spend time discussing it because it makes them more physically uncomfortable. I think their father wouldnt dismiss it like that if he had to wear it in the swealtering heat. The Jewish women (i think at the time of matan torah) took it upon themselves to cover their feet (not sure if that includes legs). So it does have alot of importance and significance. That being said, its still not ok to judge others and judge a person’s connection to Hashem and level of Torah observance based on one thing alone. I am curious. Isn’t the first part of your article Loshen Ha’ra? If your “driver” is reading this article or others – you are referring to her in a negative way. I’m not sure halachically, but a rav I once consulted recommended that I should write in a nice-enough way that if the person I’m writing about read what I wrote, it wouldn’t be hurtful. That case was different though, since it was a well-known problematic person whom I mentioned by name. In this case, the person is totally anonymous. I don’t think there’s any chance she would read it. But I toned it down anyway. i might be wrong but i do not think it is lashon hara. like chana jenny, i write about my experiences all the time. i try never to embarrass or identify anyone. i don’t think chana jenny did anything wrong here. and from the responses we can see this is something many of us struggle with. she got a ride from someone. could be anyone. happens all the time that people get rides from people. I totally get the sock issue. A few years ago I was surrounded by people who ran the gamut in terms of tzniut and I found myself needing some clarity. I sat down with someone and learned the laws of tzniut and feel much more grounded now. I don’t think the issue is socks or not socks, but rather the contradiction between home and school, which all educators say is not a good thing for kids. We deal with this all the time regarding internet. School says internet is bad and anyone who uses it is bad. Kids come home and see their parents using the internet. I agree that the issue is not socks but whether the home and school environment match. The advice to find a school where the families match your level is valuable. Having grown up ‘out of town’ and lived in places where there is only one school – there is a value to being able to set a standard for in school behavior that doesn’t necessarily match everyone’s style of living at home. The idea we express to the students is this is the halacha we are teaching and while at school we expect our students to dress and act accordingly – what you do at your home is your parent’s choice. When you get to be an adult you can choose if you will keep these halachos. Being judgmental of others is a big issue for me….